We are excited to introduce you to lovely, Luke. 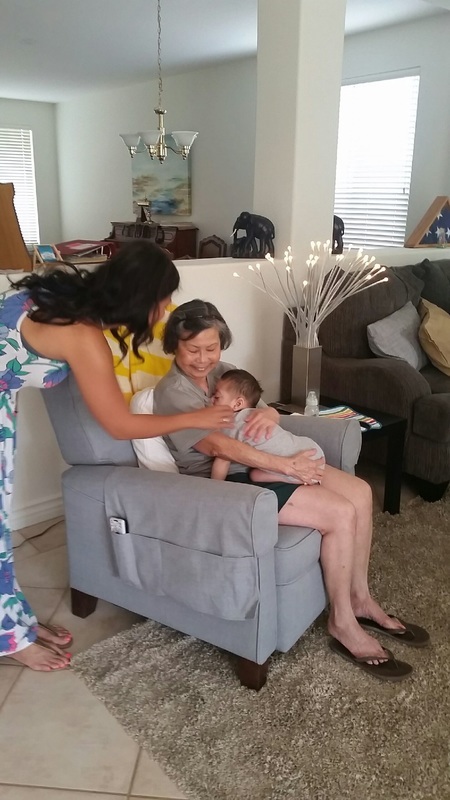 He is a living miracle and a blessing to his devoted Mom, Rein, and his doting Grandma. We heard about this angel from his OT. His pediatric Occupational Therapist has served more than hundreds of children and their families during her eleven year career but none touched her heart quite like the way Luke and his family did. Rein left the hospital with a healthy and happy baby boy. Then sadly Luke's life took a drastic change. Luke is only 1 of 200 children in the world with Aicardi-Goutieres Syndrome. Aicardi-Goutieres syndrome is a rare disorder that mainly affects the brain, the immune system, and the skin. As a result of this disease, Luke developed calcifications in his brain as an infant. He suffered excruciating pain during the early months of his life and was later diagnosed with cortical blindness. As a result, he was able to produce controlled eye movement. His life is not easy but he is surrounded by love and affection. While he may startle easily, have trouble feeding with digestive issues, and have an irregular heart-beat, he pushes on because his family is inspiring him to live the fullest life possible! Luke and is family have defied all the odds. Most children with this disease don't make it past their first year of life. Luke is 2 and a half years old and he is showing improvement everyday. His family works tirelessly to support him and makes sure every one of his needs are met. Luke's medical and therapy team shared that the family continually go above and beyond for their son. They will implement and purchase any items needed and follow through on all early intervention services. Luke benefits from a calm environment, with vibration, aromatherapy, relaxing music, gentle swinging, and opportunities for positioning. Given the severity of his disease and the fragile nature of his immune system, Luke needs to spend the majority of his time at home and in his room. This is why we are so happy to grant Luke and his family a special room makeover. While typically we focus on a child's bedroom, in Luke's case we received approval to create a special place for Luke to sleep and play in his living room. (This is where he spends all of his time and where he receives his therapies at home). Since Luke is unable to sit upright without assistance, he spends a lot of time lying down on the couch. 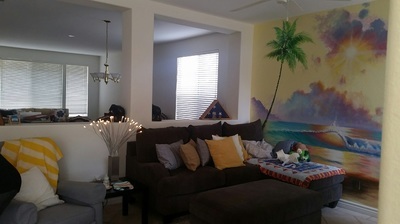 The family was beyond grateful for the stunning mural for Luke to gaze at when he rests. He has big beautiful eyes that tell a story when you gaze at him. His family believes strongly that he possesses a sense of wonder and urges to experience the things we all do but unfortunately he is unable to do - just yet! 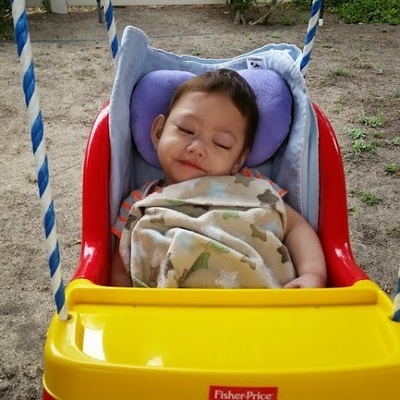 The team was able to hear the family's request and provide a beautiful room that not only created a peaceful place for Luke to rest, but also supported his love of movement with a lovely swing, and soft snuggly blankets to curl up with. We are so grateful for muralist, Kevin Anderson for his amazing mural. His custom artwork completely changed the room and provided a soft-lit glow to the warm yellow walls. Luke loves gazing into the sunset Kevin created and we couldn't be happier with the results. 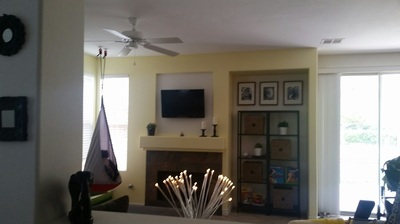 Thank you to our ever faithful painting partner, PaintGreen, for providing yet another perfect paint job for this family's new room. The colors pop and emanate happiness and joy. Thank you to Triskell Restorations for their help hanging the sensory swing for Luke! Safety is our first priority and we are grateful when experts in the community donate their time and talent to ensure our ideas are not just great - but safe and secure! 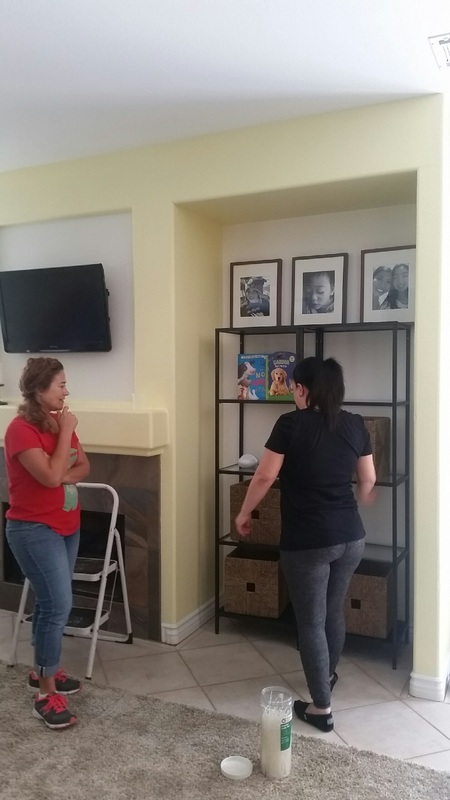 Thank you to Nasha Mullen from North County Tile and Stone for her help with the design and layout for the family room and for attending a late night shopping spree to one of our favorite stores, IKEA. Thank you to Janna Lee for helping our busy Project Manager on this endeavor - your assistance helped to keep the project on track! And thank you to Danielle, a design student from Mesa College. And last but certainly not least - thank to our fearless Project Lead, Julie Burkhart and her co-pilot, Hunter! This dynamic duo have been with Cecily's Closet from the very beginning and without their support and dedication we would not be where we are today. Julie is a dedicated hands on board member and volunteer extraordinaire. Her devotion to this organization is very much appreciated and we know Luke's Mom and Luke loved her efforts pulling off our 70th room! Thank you to North County Moms of Multiples for their generous donation to Cecily's Closet. We are so honored to have support and your donation made our 70th room possible. Originally founded as Heaven’s Mothers of Multiples in 1971, North County Mothers of Multiples (NCMoMs) is a 501(c)(3) non-profit organization offering informational, recreational and support services to parents and families of multiple birth children. Our general meetings are held from 7:00 pm to 9:00 pm on the third Tuesday of every month (locations will be announced). Each meeting typically includes either a guest speaker sharing pertinent child development information or an opportunity to socialize with other members (sometimes both). Other club activities include an expectant and new member support program, playgroups of all ages, a lending library of books, annual used children’s clothing and equipment sale, and both family and adult events during the year. The mission of North County Mothers of Multiples is to enrich the lives of families with multiple birth children within our local community. We are a diverse group of parents of multiples who have come together to form a volunteer-led, non-profit, non-sectarian, and non-commercial organization that provides education, support, philanthropic activities, social events, and networking opportunities.